After reading this fabulous review of Hinnies from Feeding boys I just knew it would be my sort of place and couldn't wait to visit. Luckily for me, Chloe from New Girl in Toon was invited along and kindly asked me to be her plus one. Yeah! I have the best friends! We parked in a nearby street on a blustery Wednesday evening and were impressed at how busy, warm and welcoming Hinnies was. We spent a good few hours catching up over very good food and I cannot give Hinnies any higher praise. In fact, I tried to book a table this weekend with Steve and the kids only to find they were fully booked - a testament to how popular the place is. 1 - Andy Hook (the man behind the multi-award winning Blackfriars Restaurant in Newcastle) is the driving force behind Hinnies. This year marks a decade since Andy sold his first restaurant, Sidney’s on Front Street in Tynemouth and is a welcome return to the coast for him with his business partner David Townsley. 2 - Head chef Jonny Wardale has previously worked for Fresh Element (the people behind SIX at Baltic). His brother Chris Wardale is the head chef at Blackfriars and along with several members of the Blackfriars team will be lending his support to Jonny. 3 -Hinnies’ menu features a range of locally inspired dishes such as a modern take on the famous Saveloy Dip: smoked sausage, mustard, gravy-dipped bap, peas pudding. Steve cannot wait to try this! I sampled the Newcastle Brown Ale slow cooked beef & horseradish dumplings and have to say this dish was superb and highly recommended. The beef was so tender and rich and the whole dish just made me smile. 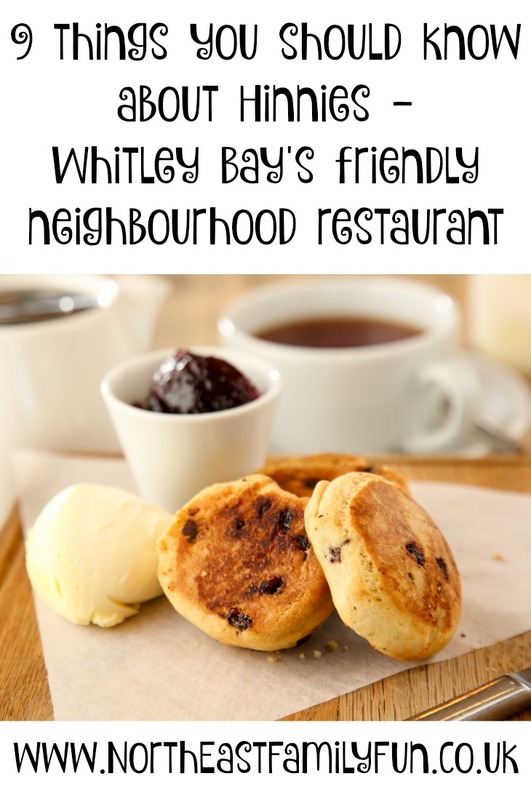 There are lots of other local comforts on the menu including North East coast creamy crab soup, Pan Haggerty and of course, Singin' Hinnies which I am definitely going to try next time. 4 - A range of menus are available including a main menu, an early evening and lunch menu (2 courses £12) and a specials board. It annoys me when restaurants don't have a specials board as I often like to try something different so Hinnies has a huge thumbs up from me for this. 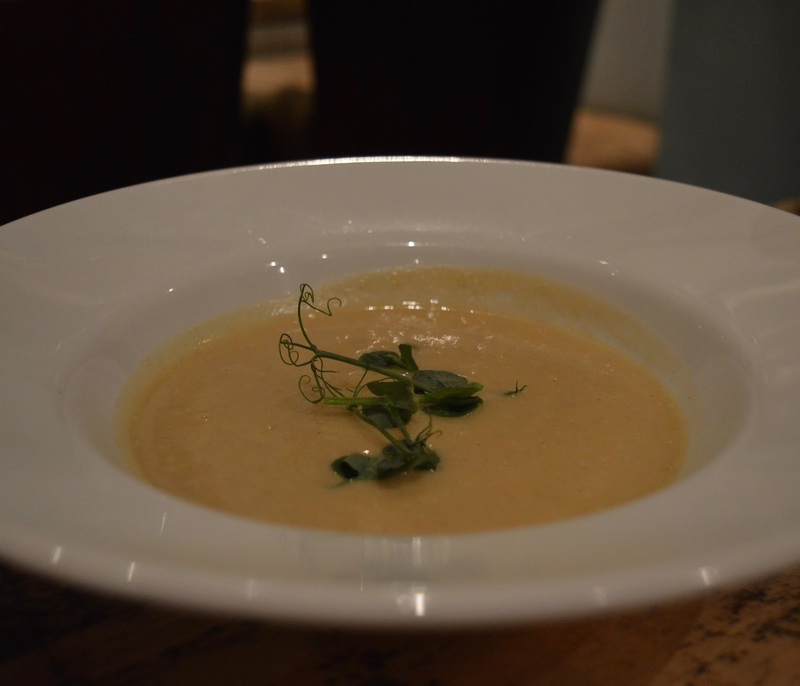 I tried the cauliflower soup from the specials board and it was creamy, warming & comforting. 5 -The interior of Hinnies was designed by Newcastle-based designer Neil Wilson and much of what you see inside the restaurant is recycled, including the chairs, tables, bric-a-brac, booths, front bar, back bar, floor, light fittings, cutlery, kitchen and kitchen equipment. This creates a rustic home-from-home feel that works well. I couldn't believe we were sitting in what once was How do you do - it is a complete transformation. 6 - Children are extremely well catered for. There are lots of highchairs readily available and a children's menu has been especially created by the team to ensure little ones don't miss out. Expect warming hot chocolates, North sea fish goujons & chips and the chance to make your own pizzas or desserts. Prices are very reasonable too with most children's meals being charged at £3/£4. 7- Hinnies has to be THE place to visit for weekend brunch. Who doesn't dream of long leisurely brunches? Well now you can indulge at Hinnies before/after a bracing coastal walk with their special weekend brunch menu available on Saturdays and Sundays from 9am. Foraged mushrooms on toast, poached hen's egg and crispy bacon or corned beef hash sound like the perfect Saturday morning treat to me and the children aren't excluded with home-cooked options such as scrambled eggs on toast available too. 8 - I always like the option to book online and I'm pleased that you can do this at Hinnies via their website. They seem very popular so I would highly recommend booking a table with as much notice as possible. 9 - Hinnies serve a bargain Sunday lunch. 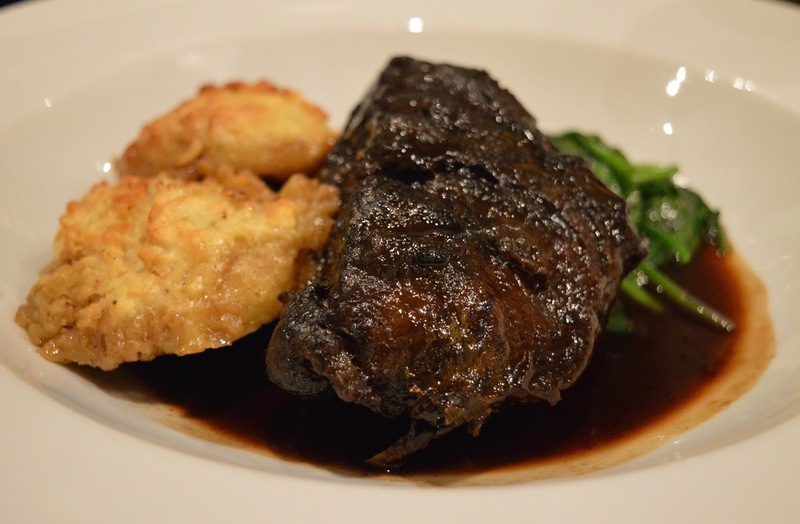 Options include locally sourced lamb or beef with yorkies, roasties, seasonal veg and gravy. Sunday lunch is available for the bargain price of £12 for 2 courses. 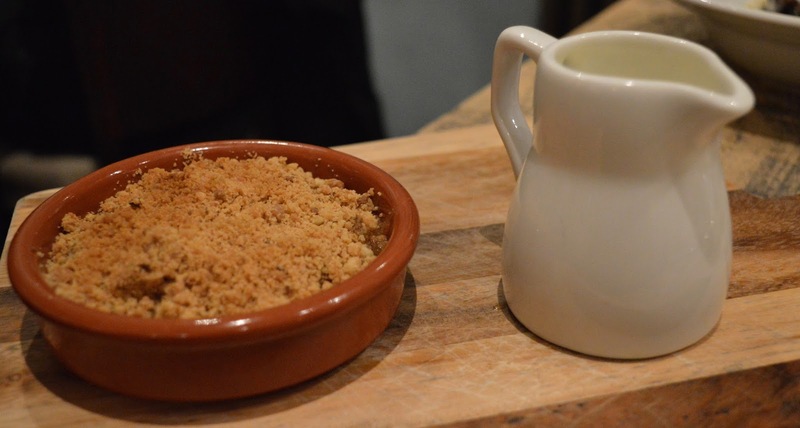 I recommend the apple crumble and custard for dessert - probably one of the best I've ever tried! What can I say, Hinnies is a true gem and is definitely going to be a favourite lunch spot of ours. I am soooo pleased it is practically on my doorstep. It feels so good to finally have a local neighbourhood restaurant with delicious food at decent prices with friendly & welcoming service. Thank you to Unique Thinking for providing most of the images used in this post. This place looks so nice, I love a day out in Whitley Bay and reckon this is just what the area needs! Can't wait to try their Pan Haggerty! Mmmmm, sounds lovely, Sam. Writing it on the calendar for when we return to the North East in May! 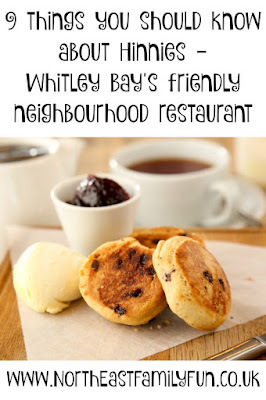 We're loving having this new restaurant in Whitley Bay and hope it's a sign of things to come with all the regeneration. Looks like you had a fab time with Chloe... the only trouble is trying to decide what to choose off that amazing menu!